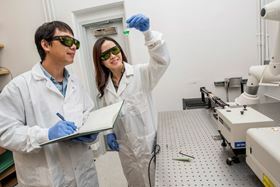 Berkeley Lab scientists Kaiyang Niu (left) and Haimei Zheng (right) have developed a new photocatalyst made from metal organic composites that can effectively convert carbon dioxide into the ingredients for fuel. Photo: Marilyn Chung/Berkeley Lab. Scientists have developed a light-activated material that can chemically convert carbon dioxide into carbon monoxide without generating unwanted by-products. This achievement marks a significant step forward in developing technology that could help generate fuel and other energy-rich products using a solar-powered catalyst while mitigating levels of a potent greenhouse gas. When exposed to visible light, the material, a ‘spongy’ nickel organic crystalline structure, converted the carbon dioxide (CO2) in a reaction chamber exclusively into carbon monoxide (CO) gas, which can be further turned into liquid fuels, solvents and other useful products. An international research team led by scientists at the US Department of Energy (DOE)'s Lawrence Berkeley National Laboratory (Berkeley Lab) and Nanyang Technological University (NTU) in Singapore report the work in a paper in Science Advances. "We show a near 100% selectivity of CO production, with no detection of competing gas products like hydrogen or methane," said Haimei Zheng, staff scientist in Berkeley Lab's Materials Sciences Division and co-corresponding author of the paper. "That's a big deal. In carbon dioxide reduction, you want to come away with one product, not a mix of different things." In chemistry, reduction refers to the gain of electrons in a reaction, while oxidation occurs when an atom loses electrons. One well-known example of carbon dioxide reduction is in photosynthesis, when plants transfer electrons from water to carbon dioxide while creating carbohydrates and oxygen. Carbon dioxide reduction needs catalysts to help break the molecule's stable bonds. Interest in developing catalysts for solar-powered reduction of carbon dioxide to generate fuels has increased with the rapid consumption of fossil fuels over the past century, and with the desire for renewable sources of energy. Researchers have been particularly keen on eliminating competing chemical reactions in the reduction of carbon dioxide. "Complete suppression of the competing hydrogen evolution during a photocatalytic CO2-to-CO conversion had not been achieved before our work," said Zheng. At Berkeley Lab, Zheng and her colleagues developed an innovative laser chemical method for creating a metal-organic composite material. They dissolved nickel precursors in a solution of triethylene glycol and exposed the solution to an unfocused infrared laser, which set off a chain reaction in the solution as the metal absorbed the light. The resulting reaction formed metal-organic composites that were then separated from the solution. "When we changed the wavelength of the laser, we would get different composites," said study co-lead author Kaiyang Niu, a materials scientist in Zheng's lab. "That's how we determined that the reactions were light-activated rather than heat-activated." The researchers characterized the structure of the material at the Molecular Foundry, a DOE Office of Science User Facility at Berkeley Lab. The nickel-organic photocatalyst had notable similarities to metal-organic frameworks (MOFs). While MOFs have a regular crystalline structure with rigid linkers between the organic and inorganic components, this new photocatalyst incorporates a mix of soft linkers of varying lengths connected with nickel, creating defects in the architecture. "The resulting defects are intentional, creating more pores and sites where catalytic reactions can occur," said Niu. "This new material is more active and highly selective compared with MOFs made by traditional heating." Scientists at NTU tested the new material in a gas chamber filled with carbon dioxide, measuring the reaction products using gas chromatography and mass spectrometry at regular time intervals. They determined that in an hour at room temperature, 1g of the nickel-organic catalyst was able to produce 16,000 micromoles, or 400mL, of carbon monoxide. Moreover, they determined that the catalyst had a promising level of stability that allowed it to be used for an extended period of time. The reduction of carbon dioxide by catalysts is not new, but other materials typically generate other, unwanted chemicals in the process. The near-total production of carbon monoxide with this material represented a new level of selectivity and control, the researchers emphasized. "The world right now is in need of innovative ways to create alternatives to fossil fuels, and to stem the levels of excessive CO2 in the atmosphere," said Zheng. "Converting CO2 to fuels using solar energy is a global research endeavor. The spongy nickel-organic photocatalyst we demonstrated here is a critical step toward practical production of high-value multi-carbon fuels using solar energy."